Samus just put those disgusting creatures on the endangered species list. A year ago, we passed up the opportunity to grab (for free) an undisclosed number of vintage Nintendo Power magazines, instead leaving them on the side of the curb. That ill advised decision haunts us today, since odds are good one of those issues included tips for Metroid II: Return of Samus, which hit 3DS not too long ago. The second game in Nintendo's sci-fi series is definitely beatable. In fact, it's quite linear, but there's no map to track one's progress. Back in the day, circa 1992, video game developers didn't hold your hand. Instead, you had to rely on memory, writing stuff down and hunting for advice/map layouts in magazines. Granted, the Internet is full of Metroid II walkthroughs, even speed runs, but it would have been cool to kick things old school. With this in mind, Samus Aran's Game Boy adventure comes highly recommended. 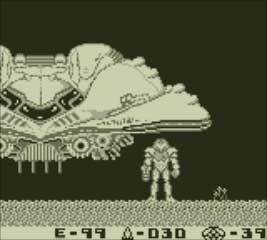 It lacks the quality soundtrack that has become a staple of Metroid titles, but the game still delivers a thrilling adventure through the strange planet SR388. Not only that, but it sets up the events that lead to Super Metroid. Here, the tough as nails bounty hunter attempts to exterminate the Metroid species before her enemies, those rascally Space Pirates, weaponize the little suckers. This means hunting the creatures down and eliminating them one by one. There's even a Metroid counter, located at the bottom right corner of the screen that displays the number remaining. Progress through the world, and Samus obtains new pieces of equipment and abilities, such as the Plasma Beam, Space Jump, Spider Ball and Spring Ball, keeping with the series' tradition of constantly upgrading her suit. To that end, the game is quite unforgiving. Nintendo places save points throughout SR388, but it's tough to remember which way is which, and what leads to where. It doesn't help that much of the environments look exactly the same. In other words, don't stop playing it for two weeks and think you can just hop back in. That's crazy talk. Stick with it, and you'll discover a classic gem that never received the proper respect it so rightfully deserved. Return of Samus may not be the most sophisticated of Metroid games, but we love it all the same. 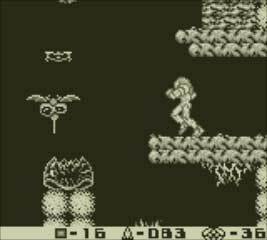 What's Hot: Detailed graphics for a Game Boy title, plenty of weapons and abilities, hunting Metroids. What's Not: Getting lost, terrain looks the same.